Do You Remember The Forgotten Real Estate Inventory? Every market is joyfully reporting a reduction in the number of homes for sale in the Realtor MLS system, but I have not seen anybody addressing the forgotten real estate inventory. I am concerned that we are experiencing a different phenomenon all together. I suspect everybody has a decent understanding of supply and demand in real estate, and that we use routine measurements of both demand and supply to determine the health of the housing market. For most US housing markets, the supply of homes is measured purely based upon the number of homes listed in the local Realtor MLS system. Would you be surprised/shocked to discover that the homes listed for sale in the MLS only represents about 20% of the real inventory of homes that need to be sold? 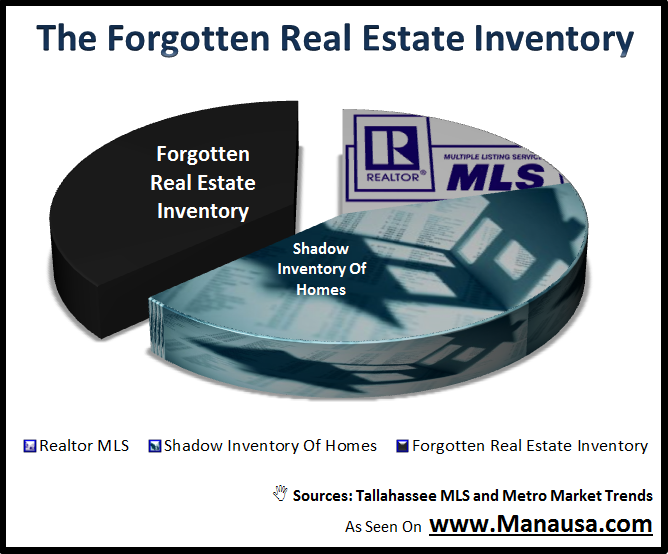 Long time readers of the Tallahassee Real Estate Blog know that an additional "Shadow Inventory Of Homes" exists, which is comprised of all those unlisted bank holdings and currently unlisted delinquent home owners. But what about that large group of homes (even larger than those currently listed for sale in the Tallahassee MLS) that tried to sell in recent years and failed? You might never have thought about it, but there have been a lot of homes that failed to sell during the housing correction, and those that remain unlisted and unsold are a group that I call the Forgotten Real Estate Inventory. It is the growing group of homeowners who have given up hope of selling their home, but they still want to move. Many of the homes that failed to sell simply re-entered the MLS after failing (sometimes more than once) and eventually sold, but you might be surprised at the number of failures that still remain in the forgotten real estate inventory. This is not a problem that is going away in the next year or so. The first graph shows that there are more than 2 years of supply in the current count of the forgotten real estate inventory, and it is growing. The real estate graph above shows that the Forgotten Real Estate Inventory is growing by more than 3 homes per day (Roughly 1,150 per year), which is about 6 months of supply. 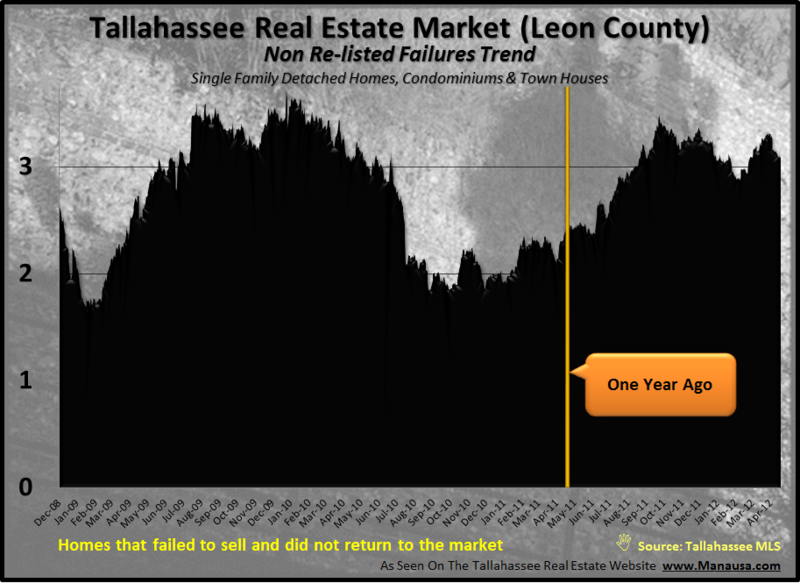 When you put the forgotten real estate inventory together with the shadow inventory and the Realtor MLS inventory, there is five years of supply of homes for sale in Tallahassee. I suspect most other markets would find similar numbers if anybody there was really measuring. So I am excited to see the MLS supply of homes falling, but I am going to withhold my celebration until I see how the shadow inventory and the forgotten real estate inventory work themselves out.